Can be used in either the left or right side engines. Made of bright red marine vinyl with 1" black webbing trim reinforcement. 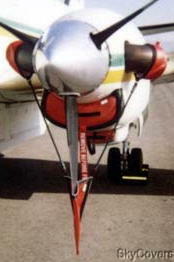 This is a one unit system that holds the prop in place with 2 exhaust covers and half inch bungie. Plugs in picture are not included and are sold separately.